The world needs dreamers, who can magnify everyone’s endurance. We all need someone who can think creatively like out of the box and can work towards the sustainable technology. The world needs dreamers rather than followers of the majority path because there are various aspects where individual skills and knowledge are challenged, where out of the box thinking is necessitated and problems solving skills are stimulated. The world requires those who dream and work for it. Everyone is a dreamer, but only a few works for it. We all need to disregard the anxiety in order to live a happy and meaningful life which we imagine each and every day in a dream. All great things start as a dream. All dreams don’t come true if we don’t work for it. Just remember one thing, it’s not about the dream, it’s about the accomplishment, great passion, and motivation behind every dream. The dream only can be valuable once we make it a reality. When the setbacks come and disappointment emerges, when anxiety tries to lock you and fears come to convince you to stay in a comfort zone, just remember the passion and great motivation behind your every desire and your visions for the prosperous life. The world needs dreamers who do, not the naysayers and fantasizers! We hope guys you find Quote "The world needs dreamers and the world needs doers. But above all, the world needs dreamers who do. 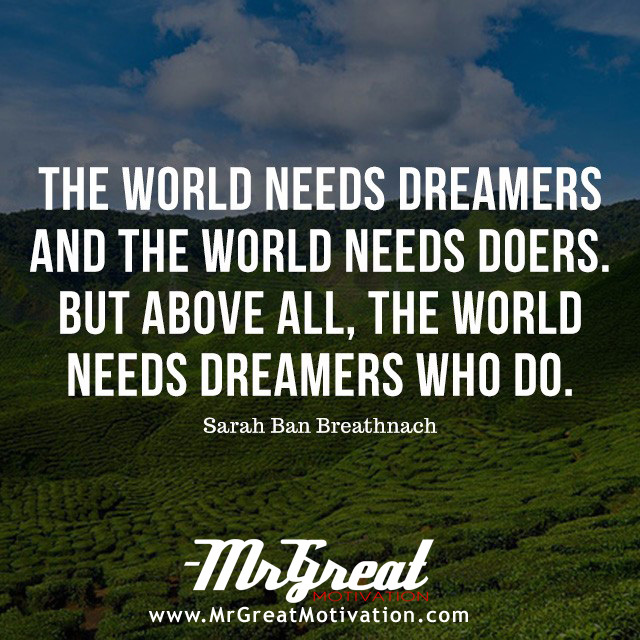 –Sarah Ban Breathnach" by Mr Great Motivations useful. If you think we have made some efforts, then don't forgot to appreciate us by sharing this Quote with your friends and family, And thanks for visiting.